Next week, Sony will release what we expect to be the PS4 console, so its no surprise that new photos have arrived showing the developer console and what appears to be the PS4 controller with a small touchscreen. The source that revealed this says this is an early prototype console sent out to some developers before the initial release. This is normal procedure for any company that wants third party development, allowing developers to get used to the system, controls and any coding changes/advantages. For this reason, it is likely that both the console and PS4 controller will look different and more polished when released. More the console side, which looks like a large ugly machine. The PS4 controller shows us a lot of new things that have been rumoured and leaked but certainly haven’t been as concrete as this photo. One of the main features we are surprised to see is the small touchpad, and we still don’t have solid ideas on how this will function. There is also a blue light at the top of the PS4 controller, which we suspect is for motion control. 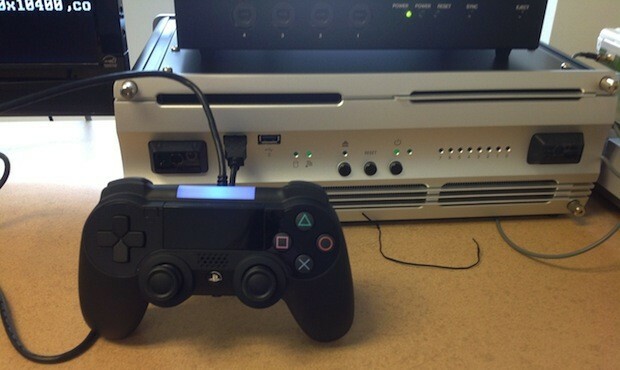 The buttons have been changed, although we see this as more of an evolution then a revolution in the controller. Many said prior to this leak that they want the PS4 controller to maintain most of its design and functionality that the PS2 & PS3 has. We can see why, the PS3 controller is very durable, usable and generally just a very well designed controller. To medal with that winning formula, Sony must be careful on what changes they make. The touchscreen is generally disapproved by core gaming fans, although it may work better for small games & apps. Whatever the case, we will hopefully see the finished product next week, on Feb 20. The Sony event is most likely a first tease, but it will give us some idea about what we will see when the PS4 is released.